As has become custom for the six previous years of the National Signing Day Running Posts, I’ll be pulling together all of the best news, pictures, videos, rumors, etc. and putting it all right here. There’s no need to sift through 5,000 tweets to read about a guy signing on the dotted line. I’ll do it for you. All right here. It’s cozy. Stay a while. In fact, I’ve already got all of Auburn’s early enrollees, hard commitments, and hopeful targets that will pick up a hat at some point listed below. I mean, it’s literally all right here for you. As the faxes roll in throughout the day, I will post updates here in reverse order to make it easier for you. 10:55 pm – Alright, I’m calling it. There’s nothing more to do today. 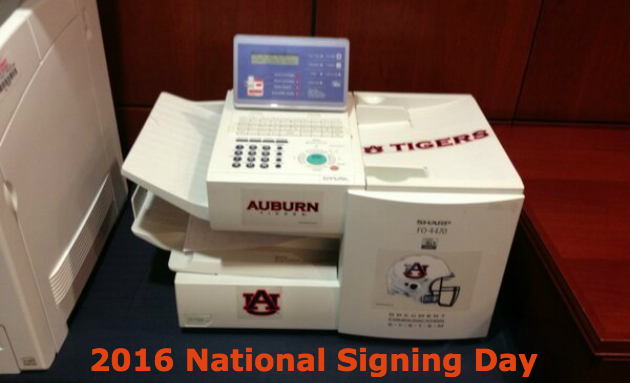 Auburn’s 2016 Signing Day was a success, which made this post a success. Thanks to everyone that stopped by. I’ll be posting a pretty list of the signees tomorrow (update: it’s here) and put a bow on the whole thing. So that’s it. It’s over. Leave. But if you need one more little tidbit, go ahead and watch Auburn’s short behind the scenes video from today. War Eagle. 9:00 pm – Let’s live chat… The live chat is over. We had a good ol’ time. You should’ve joined. If you’d like to see what was said, you can do that here. 6:47 pm – Gus Malzahn spoke with the media after the class was complete. These are all of the words he said. If there’s video posted somewhere, it will go here once I find it. 5:45 pm – I quickly recapped Auburn’s strong haul on the way home in BlogleSpot #121. You can listen below. We’ll be doing a live chat here later tonight as well. Say around 9pm CT. Come back and join. 4:00 pm – These are the updated recruiting service rankings after the Myers brothers have signed. ESPN has televised both announcements, but still have not included them in the rankings. But they did move Texas up 22 spots to drop Auburn one spot. 3:42 – ESPN has posted the Derrick Brown announcement and his following interview. 2:14 pm – And that’s a big BOOOOOOOOM from Auburn. 5-star DT Derrick Brown (#9 player overall) has picked Auburn over Alabama, Georgia, Mississippi State, and Tennessee on ESPNU. That’ll help. Update: the fax is in, and Derrick Brown is the most hated person in Georgia. 1:25 pm – David Marshall, who had committed and decommitted to Auburn twice, then visited Athens the last two weeks, has unsurprisingly picked Georgia. 1:00 pm – ESPN has posted the Nate Craig-Myers announcement and his following interview. 12:50 pm – These are the updated recruiting service rankings after the Myers brothers have signed. ESPN has televised both announcements, but still have not included them in the rankings. But they did move Texas up 22 spots to drop Auburn one spot. 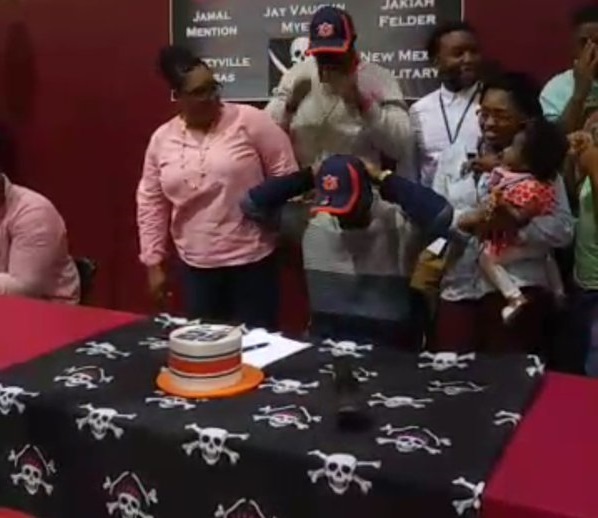 12:12 pm – Jayvaughn Myers, half-brother of Nate Craig-Myers has used a cake to announce that he will be signing with the “University of Auburn.” It’s a shame they couldn’t play together at Auburn University. Update: he sent his fax to Auburn University, so we’re all good. 11:11 am – These are the updated recruiting service rankings as they stand now. I don’t believe ESPN is including Nate Craig-Myers just yet. 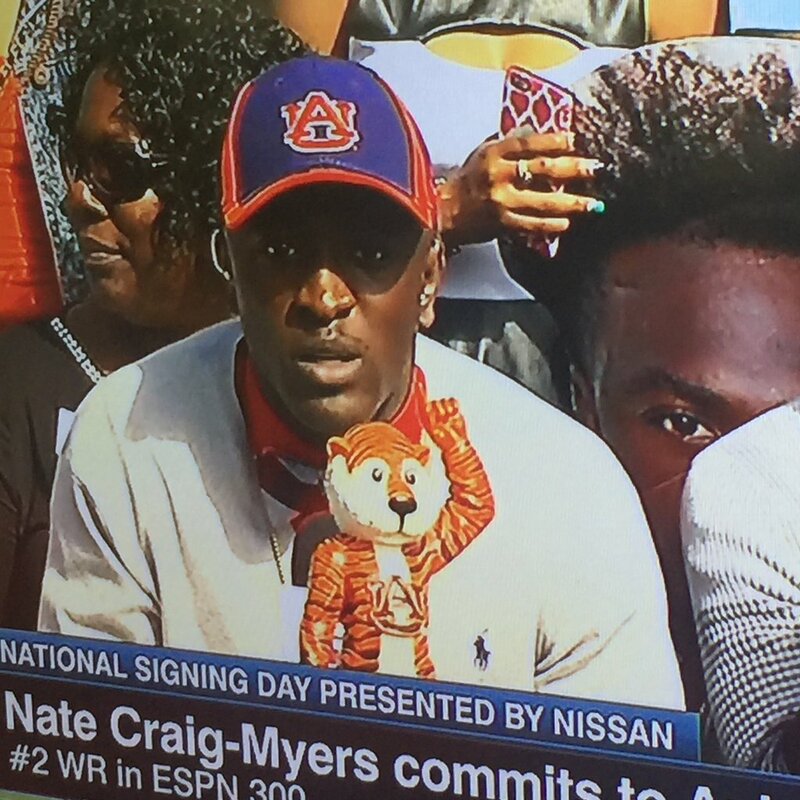 10:18 am – Nate Craig-Myers has just announced on ESPNU that he will attend Auburn University. He did so with a small Aubie statue, choosing the Tigers over North Carolina. Update: his fax is in. 9:52 am – The first slight surprise of the day. Daniel Thomas (2-star DB, Montgomery, AL), who two days ago said Auburn told him their class was full, has apparently received and accepted an offer today. Most would say the fact that Nigel Warrior went to Tennessee, and maybe the impending flip to Georgia from David Marshall is what opened up a spot. That 2-star status (on Rivals) might make you think it’s not a good get, but he had offers from Clemson, North Carolina, and multiple ACC schools. 8:48 am – Tashawn Manning has made it official as well. And now I’m already running out of clever ways to say that the guy signed with Auburn. This does round out the hard commitments for Auburn and all of the guys we fully expected to sign today. 8:45 am – What a character! Marlon Character has affirmed his commitment and has used the facsimile machine to prove it. 8:05 am – And we have the first pick of the day with Prince Michael Sammons choosing Auburn over Michigan State. He didn’t pick up a hat. He just faxed it in. Low key. I like it. Oh, and his name is Prince. So now Auburn has two princes. That’s what I said now. 8:00 am – As always, some guys just couldn’t wait till we got up and settled in our offices to send in that letter. In fact, 5 of the hard commits are already in. I knew #BroHam would sign with Auburn, but I didn’t know he’d shut down the All-Name Team this early. Shut it down. All spots are full. To start, these guys are already enrolled at Auburn, but they are part of the 2016 class. And they are just as important as any guy who puts on an Auburn hat on National Signing Day. In fact, they’re technically better because they’re already going through workouts and will participate in this year’s Spring practice. And these are the guys that are supposed to have an Auburn hat in front of them as they announce ton National Signing Day. Some will be on the television. If so, I have the time (all times Central) and channel listed. I’ve also listed my predictions, which are based on next to nothing. These are the current rankings from the recruiting services before any signatures have been put to paper. They are just based on current commitments. There will be a live chat at some point later in the day (follow me on Twitter to get updates on that), but feel free to talk about it all in the comments below or over in The Barn. Just for nostalgia, here’s how things went in past years: 2010, 2011, 2012, 2013, 2014, 2015.